BUDDING Donegal food and drink entrepreneurs are being invited to apply for an intensive business acceleration programme offering one-to-one mentoring and possible investment for chosen candidates. Food Works, jointly run by Bord Bia, Enterprise Ireland and Teagasc, is back for its fourth year with the aim of identifying start-ups with a winning food product and global export potential. After a shortlisting process, successful candidates will begin the programme in June. 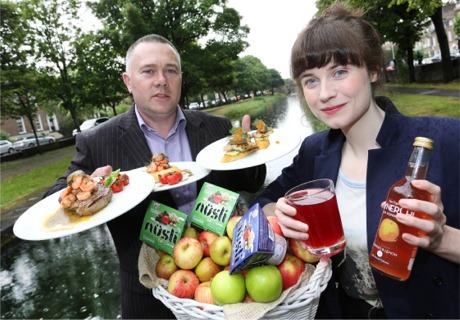 Past participants include Irish Atlantic Seafood Company and Synerchi Kombucha from Donegal. Sixty start-ups from all food sectors across the country have participated in Food Works in the last three years with 60% of them now trading. "The available supports provided by Bord Bia, Teagasc and Enterprise Ireland include consumer market research, business plan development, technical advice, commercial viability testing in addition to access to fast track access to R&D facilities and possible investors and state funding," said a Food Works spokesperson. Past participants of the Food Works programme, James Grimes from Irish Atlantic Seafood Company and Laura Murphy from Synerchi Kombucha in Donegal. Interested parties are invited to register online for an introduction meeting in Dublin, Cork or Galway via www.foodworksireland.ie .